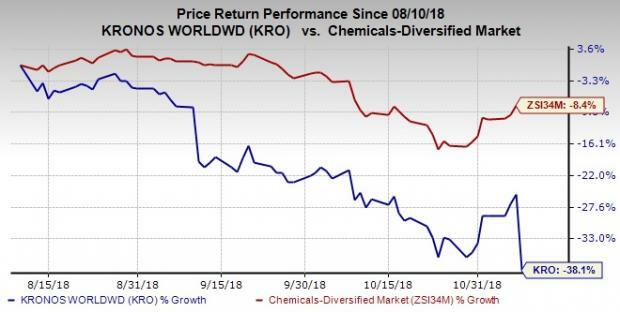 Kronos Worldwide, Inc. KRO posted net income of $32.6 million or 28 cents per share in third-quarter 2018, down from $73.8 million or 64 cents in the year-ago quarter. Earnings missed the Zacks Consensus Estimate of 59 cents. Per the company, favorable impacts of higher average selling prices was more than offset by the unfavorable impact of lower production and sales volumes along with higher raw materials and other production costs. Net sales went down around 12% year over year to $410.3 million due to the net effects of lower sales volumes and higher average TiO2 selling prices. The figure missed the Zacks Consensus Estimate of $467 million. Average TiO2 selling prices rose 9% year over year in the quarter. The increase can be attributed to higher prices in the North American and European markets, which were partly offset by lower prices in the Latin American and export markets (due to changes in customer mix). The company’s TiO2 sales volume fell 19% due to lower sales in the European and export markets. Per the company, this depicts the effects of reduced shipments as customer inventory levels returned to more normal levels. Profit in the TiO2 segment was $61.7 million in the third quarter of 2018, down from $99.5 million in third-quarter 2017. As of Sep 30, Kronos Worldwide had cash and cash equivalents of $432.3 million, surging 36.5% year over year from $316.7 million. Long-term debt was $465.2 million, down from $467.5 million in the year-ago quarter. Cash flows from operating activities were $199 million for the first nine months compared with $218.3 million for the same period a year ago. Kronos Worldwide expects production volumes to fall in 2018 from the year-ago level. It also expects sales volumes for 2018 to be lower year over year. The company continues to believe that customer inventory level changes are short term and global demand remains solid. The company will continue to examine current and expected customer demand levels in the near term and align production and inventories accordingly. It expects changes in customer inventory levels to continue decreasing through the fourth quarter, which may lead to fall in selling price. It envisions net income in 2018 to be lower on a year-over-year basis, mainly due to the favorable impact of the aggregate net income tax benefits recognized in 2017. Shares of Kronos Worldwide have lost 38.1% in the past three months compared with the industry’s 8.4% decline. Kronos Worldwide currently has a Zacks Rank #5 (Strong Sell). A few better-ranked stocks in the basic materials space are Methanex Corporation MEOH, CF Industries Holdings, Inc. CF and Domtar Corporation UFS, each sporting a Zacks Rank #1 (Strong Buy). You can see the complete list of today’s Zacks #1 Rank stocks here. Methanex has expected long-term earnings growth rate of 15%. Its shares have rallied 28.1% in the past year. CF Industries has expected long-term earnings growth rate of 6%. Its shares have gained 44% in a year. Domtar has expected long-term earnings growth rate of 5%. Its shares have moved up 8% in the past year.